I just realized it’s Friday. I really thought it was still Thursday, but everyone was wishing a happy weekend so I had to check my computer date and, of course, it is Friday. Again. I can’t imagine what happens to the days, where they go so fast, how little I seem to be getting done, and how perfect the weather is for just snuggling in bed with a good book! Speaking of good books, what good books have you read lately? You already know my preference tends to light, fast-paced reading, so adventures, mystery and detective/spy stories, fantasy, and science fiction. When I am in the mood, though, I will read history, a lot of historical fiction, biographies, and autobiographies. When I can get my hand on them, I will read prize-winning books, and I decided to do just that when I went to a literary trivia contest with a bunch of writer friends and we won first place (woohoo! ), which gave us first choice of a varied selection of books donated by Indigo. 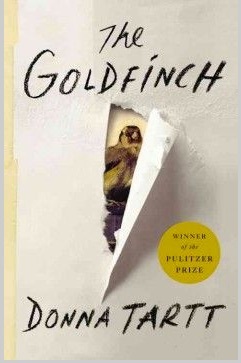 I picked the Pulitzer Prize-winning book The Goldfinch by Donna Tartt. That was several months ago. I finally decided to read it and am about three-quarters of the way done. I’m not going to present a summary here—you’ll have to read it yourself to find out the story. What I am going to say, is that one thing that came to my mind when I finally put it down a couple of nights ago (because I always read at bedtime), was Charles Dickens’s David Copperfield. The parallelisms are definitely there: Both Theo Decker and David Copperfield launched themselves into the world at the death of the mother; both boys had to live in different places, not all of them welcoming; both had a little girl they adored; both are significantly affected and influenced by another young boy who is not necessarily the best influence in their lives. I can’t really say more because I’m still not too far past halfway through. Nonetheless, Theo’s journey takes him places the way David’s has, through New York and Las Vegas painted with as much careful and colourful detail by Tartt as Dickens did the England of his times. Tartt’s attention to detail and vivid descriptions, plus the care with which she develops her characters are certainly reason enough for the book to win the Pulitzer. And that’s just the language and writing style. One must appreciate the underlying themes and the way her plot unfolds, as well, but which I’m not going to delve into right now. I’m pretty certain the complex plot, struggling characters, and attention to detail Tartt has woven into this story are why NY Times book reviewer Michiko Kakutani has called The Goldfinch a Dickensian novel. I can’t wait till bedtime.